How does a Weddell Seal navigate in the dark world under the ice or during an Antarctic winter when there is no sunlight? Remember that a seal is a mammal and has to come to the surface, or an opening/hole in the sea ice, in order to breathe. Weddell Seals can swim up to 1.5km (~1 mile) from their breathing hole and might be able to remain underwater for up to 80 minutes, though they prefer to dive for periods of only 20 minutes. In order to be able to feed in all seasons with changing sea ice conditions and return to breathing holes, Weddell Seals must have an exceptional navigation system. How do they do it? A group of biologists, including Randall Davis (Texas A&M, Galveston), Terrie Williams (U. California, Santa Cruz), Lee Fuiman (U. Texas, Austin), colleagues from University of Auckland, graduate students and analysts have come to Antarctica to shed light on this question of navigation - they are "Seal Team 8". Seal Team 8 pose a hypothesis that seals have an ability to sense the magnetic field in the Earth and use it much like a compass. The team believes that seals use specific swimming patterns to help calibrate their internal compass and might provide them with an understanding of the magnetic field in their local environment. Once the seals have this understanding, they can swim back to their breathing hole in an efficient manner after traveling in many directions while foraging for food (e.g. following fish). 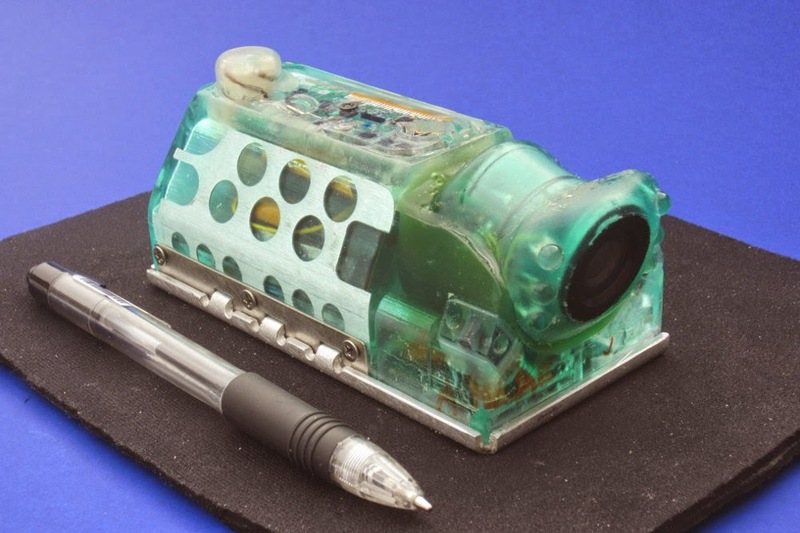 To test this hypothesis, Seal Team 8, have carefully instrumented some seals with devices that record the depth, direction and distance traveled (plus the device has a near-infrared video camera, which is sensitive in low light conditions). The device causes no harm to the seals and is removed after a week or so. The team hope to collect data from over 1000 seal dives at three different breathing holes, each of which has a different local magnetic field. Do the seals dive in a different pattern depending up the local magnetic field? The team are also investigating how seals behave when they are moved to a new and previously unseen breathing hole; what does a seal do to understand its new surroundings? Seal Team 8 will analyze their data to answer these question once they finish work in Antarctica. 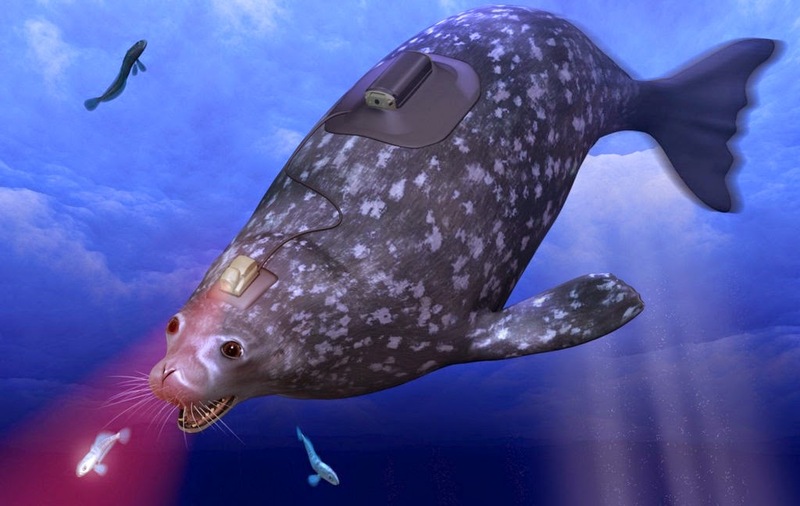 Artist rendition of a Weddell Seal wearing a recording device. The device near the head is the camera and motion detecting device (shown in next picture) and the other module is the power pack. 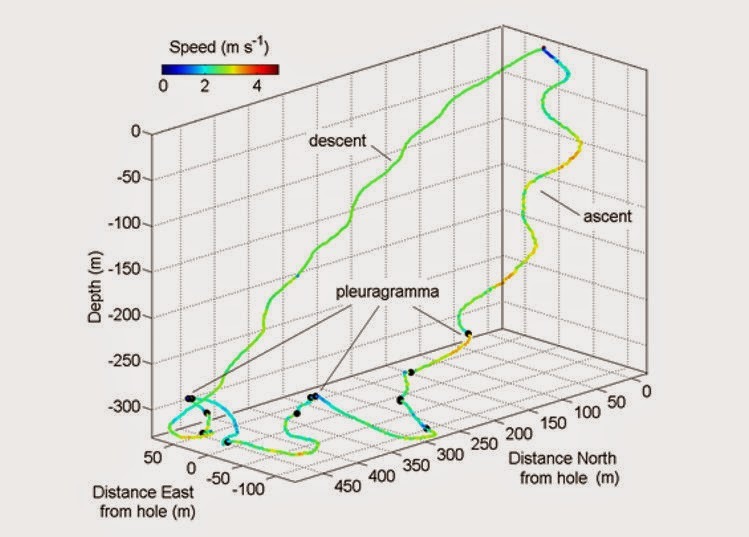 An example of data captured by the recording device during a seal dive. We can see how far and deep a seal traveled as well as the speed it was moving during different parts of the dive.